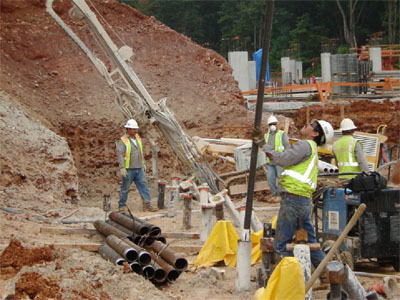 The Foundation Specialties, Inc. Geo Con Division (FSI GEOCON) is active throughout the Mid South Region of America. We service the states of Arkansas, Missouri, Oklahoma, Kansas, Texas and Louisiana. The Supportworks GEOCON Division is active in the installation of micro piles and grouted anchors. We service the south central states of the United States including; Arkansas, Missouri, Oklahoma, Texas, Louisiana and Kansas. A micropile is a small diameter, drilled an grouted reinforced replacement pile. It is constructed by drilling a borehole, placing reinforcement, and grouting the hole. Micropiles can withstand axial and/or lateral loads and may be considered a substitute for conventional piles or as one component in a composite soil/pile mass, depending upon the design concept employed. Micropiles were originally conceived in the early 1950's in response to the demand for innovative techniques for underpinning historic buildings and monuments within Italy. They have been utilized in the U.S. on a limited basis since the early 1970s but have increased in popularity beginning in the Mid 1980s. Micropile applications include Structural Support for new and existing foundations, earth retention, & soil stabilization. Call our Geo Construction Division and ask for Paul Gintonio or Dr. Sean Campbell for more information on the services and capabilities of the Foundation Specialties Geo Construction Division. Call 1-833-839-2727 or contact us today for a Free Estimate and let the Supportworks Geo Con Division provide your company with the quality and attention to detail that your projects deserve. The premier foundation repair company in this area...installations are consistently superior in design, materials and installation. I have worked with Foundation Specialties, Inc for many years and numerous projects and have found them to be the premier foundation repair company in this area. Their pier and micropile installations are consistently superior in design, materials and installation. Always a very positive experience. I have known FSI for over ten years. My experience with them has always been a very positive one. They work with the project team to come up with a cost-effective solution. Their input during the early stages of the project involving special applications such as micropiles and soil nailing has been very helpful.